She then proceeded to tell me stories of her childhood, how she was raised and her love for the country where she was born. As a baby when we left, I would have never had these experiences and memories. All I know of my country and people is blood and bombs; there is no beauty in my memories. I can begin to understand my mother’s outlook because, as a Canadian, I would never want to leave or raise my children elsewhere. Iraq is not my home. I am now Canadian. Being a refugee never seemed like a big deal, up until this past year with the Syrian refugee crisis. People were never hesitant to express their bias and hateful opinions about my people and though there was a lot of positive outreach for the refugees, particularly amongst students. There was still a fair share of those who thought refugees had no place in our society. In 2003 when my family first came to Canada, it didn’t seem odd or abnormal that we were people of colour or people from a different country. There was never a “predominate” culture. When I was a kid, I grew up with friends of all races, religions and sexualities. Children don’t see colour. They don’t see race and they don’t understand sexuality; all they see is human. At some point as my friends and I left childhood behind, and we began to acknowledge we were all different. Human? Yes, but very different. These are the differences that create the societal issues we face on a daily basis. I understand race is and will always be an issue, but I never noticed the hate geared toward my people until we were brought into the media like criminals. When the media displays political leaders such as Donald Trump and Stephen Harper speaking poorly about those of Arab or Muslim descent, it resonates with consumers of mass media. When things go wrong, people want to blame and point fingers at anyone but themselves. That media provides them with someone to blame. The issue with political platforms such as this, is the populace tends to believe what they are told instead of finding out for themselves. When the media is constantly bombarding their viewers with ideologies that present all Middle Eastern, Arabic or Muslim people as violent terrorists, hate crimes and racial violence shouldn’t come as a surprise. Fear stems hate and violence. People don’t want to live in fear. When you attribute this fear to a race, people will no longer want to live amongst those people. I remember sitting in my political science lecture talking about the upcoming election when my professor asked the class about their views on immigration and the refugee crisis. This is when I started to realize there are people who are simply too uneducated about the issue and cannot comprehend that “being dangerous” is not confined to a religious or racial group. Of course there are violent Muslims but it doesn’t mean that all Muslim people are bad, just like not all Americans can be blamed for the constant wars that force these people out of their countries. I don’t know if I was just sheltered from ignorant opinions or if they were becoming more constant, but I began to notice these things more when I was talking to people. I always get the same reactions when people ask me where I was born. I respond with “Iraq” and get either a look of pity or complete fear. Fear is the overarching problem. We are looked at as if at any given moment we may have a violent outburst or act uncivilized. The worst part of it is that all people with a remotely similar skin tone to mine are categorized into one group, as if being “brown” doesn’t mean 100 different things. 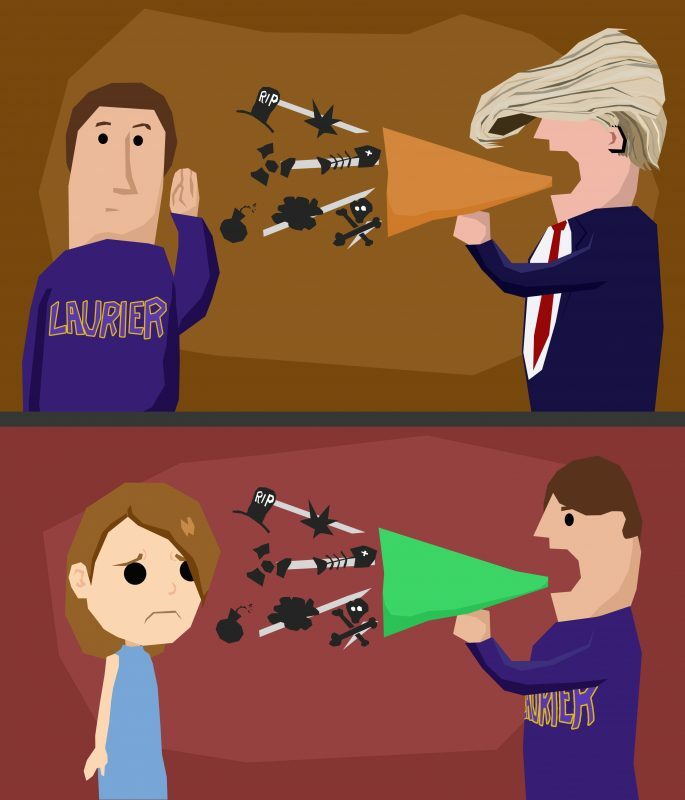 I understand that at Laurier, the majority of students will be accepting, but there are the few that aren’t. When someone displays their negative opinions about a certain race or group, other students have no choice but to either support or retaliate against it, which only creates more hate. Because of the way people like me are portrayed in the media, consumers seem to have no choice but to believe what they are told. And what they are told, sadly, just isn’t true.